Spice up your patio or walkway this fall with Sun Bricks, the solar-powered ground lighting system that will guide people to your front door with their inviting glow. 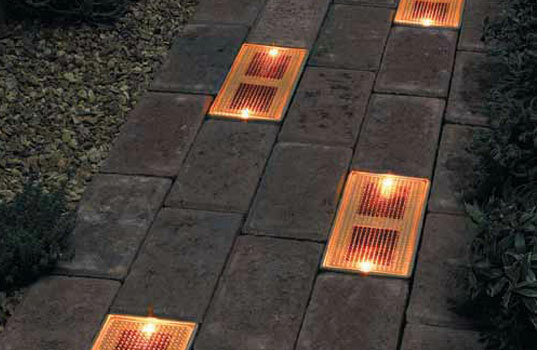 These flush-to-ground patio pavers are composed of LEDs powered entirely by the sun – meaning no burn-outs, bulb replacement or extra charges to those ever-increasing energy bills. No external wires makes installation a snap – just swap out existing pavers with Sun Bricks. One day of charge provides each Sun Brick with eight hours of amber-colored illumination, just long enough to get all of your visitors in and out of the house. Sun Bricks are an inspirational idea for the holiday seasons, what with all the expected (and unexpected) guests. I've clicked the "$59 a pair" link and been redirected to a site that doesn't have them listed anywhere. Is there another outlet that I can contact? I purchased a set of these and are happy with them so far. I will post an update if I have any problems. http://www.outdora.com/ had the best price. At their site do a search for Solar Walkway Brick Lights. I got 2 for 45.62 with Free shipping and handling (7/07). If you are looking for 20 or more I saw them at http://www.comforthouse.com/bricklight.html for a better price. I don't have any experience with comforthouse. However, I can say Outdora shipped quickly and I had no problems with them. They are made by Smart Solar. How long will the light emission last? many of these last only a couple of weeks. What a great idea, it really helps set a back yard path apart from the typical stone with cheesy plastic path lights. Now, if only I had a path to light...oh well, a small disadvantage of living in a city. They look more like they're really meant to be embedded in paths, what with the block-like design. It would be good to have more details about how they work, and to see if they can be used for other than lighting paths or as paved in paths.